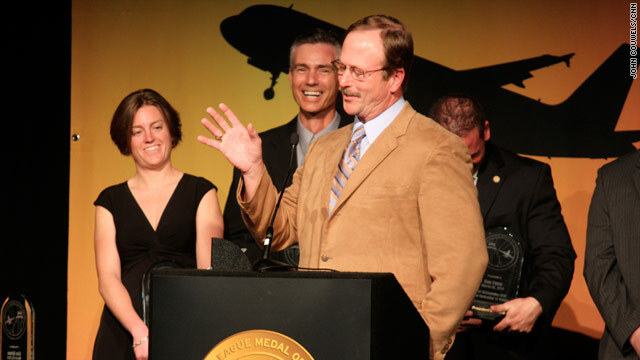 Doug White, a Louisiana pharmacist, speaks at a ceremony honoring the flight experts who helped him land a plane. Orlando, Florida (CNN) -- "These people saved my family from an almost certain fiery death." Doug White speaks highly of the air traffic controllers and flight instructor who helped talk him through landing a plane last year after the pilot died. He and his family finally met the team last week, after they received the highest honor from the National Air Traffic Controllers Association at a ceremony in Orlando, Florida. In April 2009, White, 56, and his wife and their two daughters were returning to Louisiana after attending a funeral for White's brother. Less than 10 minutes after their private chartered plane took off from Marco Island, Florida, the unexpected happened. "I've got to declare an emergency. My pilot's deceased. I need help," White told the control tower. He had seized the radio after the pilot had fallen unconscious. "I need to get this on the ground. I'm flyin' a King Air." Luckily, White had three months of flight lessons, but he had flown only a small, less-sophisticated single-engine plane. That's like going from a Volkswagen to a race car, he said. In the background of their conversation, dozens of controllers were scrambling to reroute flights while Fort Myers International Airport prepared to accept the plane. "Disengage the autopilot. We're gonna have you hand-fly the plane," instructed controller and experienced pilot Lisa Grimm said. "You find me the longest, widest runway you can, ma'am," White responded in a deadpan Louisiana twang. Controllers in Fort Myers reached out to flight instructor and pilot Kari Sorenson, who was familiar with the King Air plane. At last week's reunion, Sorenson said he relayed through the controllers only the most critical information needed to get the plane safely on the ground. White jokingly accused Sorenson of withholding some information. "Would you want to have heard it?" Sorensen joked back. 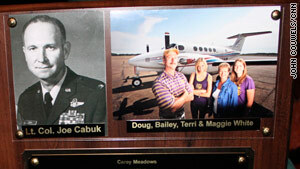 A plaque shows the White family next to an image of the pilot who died shortly after takeoff. Sorensen had high praise for White's maneuvering of the twin-engine plane. "Doug learned to fly that plane in 20 minutes," Sorensen said. "I don't think you could have made the plane more complex or the pilot less experienced and have had a successful landing." Grimm said she remembered White's steady demeanor through the whole incident. "He was like the coolest cucumber," she said. Shortly after the pilot slumped over in his seat, White yelled for his wife to come up to the cockpit. Terry White recalled that she was initially annoyed with her husband's tone, thinking he wanted her to bring him a soda. Once she realized the gravity of the situation, "my first thought was my girls," she said. "That's just the way he is," she said. There were times, White admitted, when he got nervous. 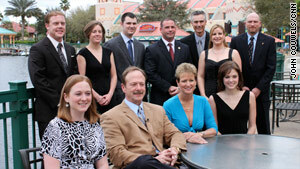 The White family, seated in front, meets the team of aviation experts who helped save their lives last year. "I thought they were leaving me out there stranded," White said. "And it's real quiet in that airplane when nobody's talking to you." His teenage daughter Maggie White said she felt helpless. "I mean, what could I do? Nothing, just sit there and pray and, you know, throw up," she said. White said he felt a bond with the team of air traffic controllers, as if they had been in combat together. The White family was shocked to learn during the reunion that they were given only a 5 percent chance of surviving. The Louisiana pharmacist has gone on to receive his pilot's license, saying he never wants to be in the same situation again. "If you're gonna die, at least die trying not to," Doug White said.